The Vertical Sleeve Gastrectomy procedure generates weight loss by restricting the amount of food (and therefore calories) that can be eaten by removing 85% or more of the stomach without bypassing the intestines or causing any gastrointestinal malabsorption. It is a purely restrictive operation. It is currently indicated as an alternative to the Lap-Band® procedure for low weight individuals and as a safe option for higher weight individuals. This procedure generates weight loss solely through gastric restriction (reduced stomach volume). The stomach is restricted by stapling and dividing it vertically and removing more than 85% of it. This part of the procedure is not reversible. The stomach that remains is shaped like a very slim banana and measures from 1-5 ounces (30-150cc), depending on the surgeon performing the procedure. The nerves to the stomach and the outlet valve (pylorus) remain intact with the idea of preserving the functions of the stomach while drastically reducing the volume. By comparison, in a Roux-en-Y gastric bypass, the stomach is divided, not removed, and the pylorus is excluded. 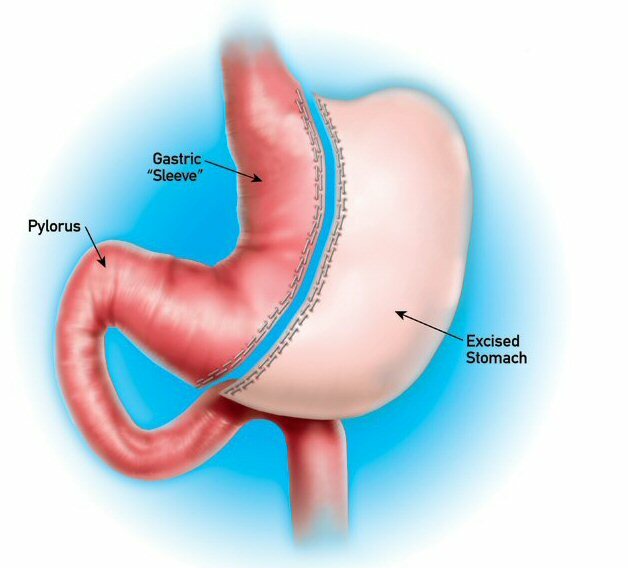 The Roux-en-Y gastric bypass stomach can be reconnected (reversed) if necessary. Note that there is no intestinal bypass with this procedure, only stomach reduction. The lack of an intestinal bypass avoids potentially costly, long term complications such as marginal ulcers, vitamin deficiencies and intestinal obstructions.